This photo was taken by my long-time friend Marc Farjeon, who passed away recently. I just heard this news tonight. In 2001, I was part of a performance art workshop led by Denise Uyehara. 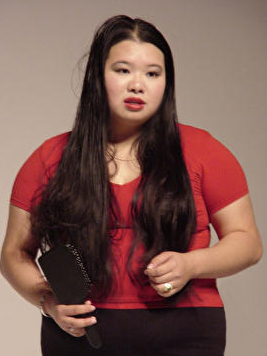 In the piece I wrote and performed, my waist length hair and a hairbrush were my props. Marc was an avid photographer who would frequent political events and rallies, but that night, he was in our audience and took pictures of our performance. This is one of the few pictures of me with my hair down. My head is spinning right now from the news about Marc. I’m grateful that Jim B, my friend who introduced me to him, remembered to call me and let me know. I need sleep. I have a full day tomorrow and now am going to find a way to attend at least part of a memorial gathering for Marc. The jozjozjoz.com archives for Saturday, September 27th, 2008.